The story of our engagement for sustainable development is closely related to the story of the Triathlon de Nyon, which is about pleasure, respect and cohesion. The unique landscape of our region, the trusting relationships as well as the proximity to local players and the quality of the races are at the heart of the Triathlon de Nyon and give it singular character. For several years now, the members of the committee and numerous volunteers are committed to organise a sporting event, which respects the environment, the citizens and our region for a shared vision: to preserve the foundations of the Triathlon de Nyon. Our fields of action revolve around three main pillars: social, environmental and economic. Through this approach, we are taking into account all aspects that make up the Triathlon de Nyon and we improve our practices while reducing their impacts. 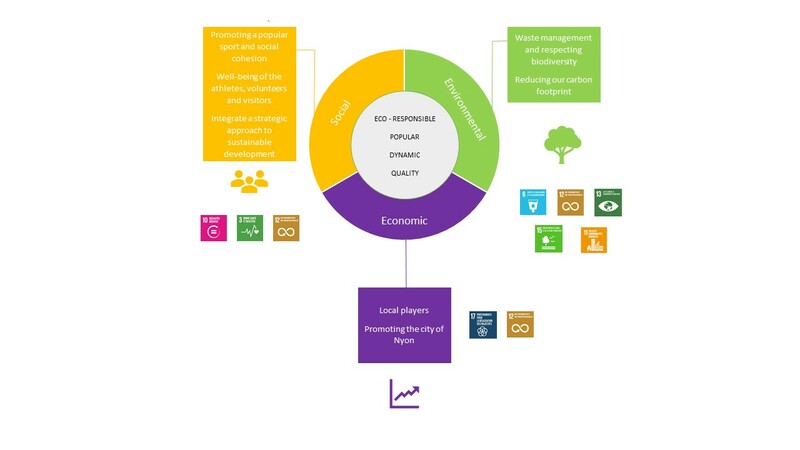 We consider our engagement for sustainable development as a process of continuous improvement of the organisation and management of our event and our performances on the social, environmental and economic level. Therefore, we regularly update the information on this website in order to provide a transparent overview of our current actions and report on our progress made.